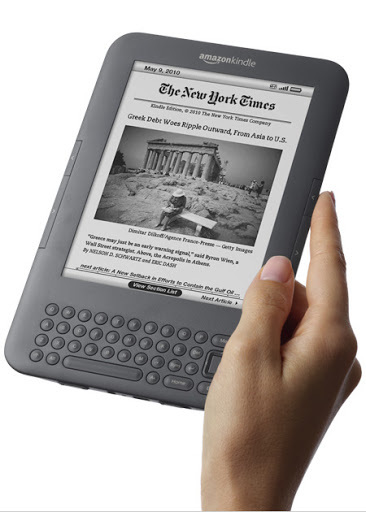 I had a birthday last month and my husband bought me something I had been wanting for a while, an Amazon Kindle 3. I was so excited to get this gift. I did a WHOLE lot of research and I am so happy I decided on the Kindle. I wanted to be able to consolidate all of the books I was reading into one space. Plus, saving trees in the forest and space on the shelves in my house isn’t bad either. But I just wanted a reader. I didn’t want an iPad because I didn’t want to have the temptation of being able to get on the internet in a couple of clicks, or check my calendar, etc. Plus, the backlit screen is not good to stare at for hours and it is rather heavy and bulky (just to read from). I didn’t want the Nook because it is also rather bulky and has the annoying screen at the bottom. Amazon hadn’t disappointed us yet so we ordered the Kindle 3. It is by far the coolest gadget I have had in years. Hands down. It is so small and so easy to read. I ordered the complimentary case that snaps onto it and it is like you are really holding a paperback to read. My husband jokes that the screen looks fake because it really does look like you are reading the page from a book. It is easy to navigate and holds 3,500 books. The battery life lasts ONE MONTH with Wi-Fi off and 3 weeks if you forget and leave Wi-Fi on. Okay, okay, I know I sound like a commercial for the Kindle so I will stop with all the details. But if you think I wouldn’t be on an actual commercial for the Kindle, you would be wrong. I want to get on my roof and shout how happy I am! If you are in the market for an electronic reader, look no more. And with the $139 price tag, you really can’t go wrong. Okay, end of commercial.